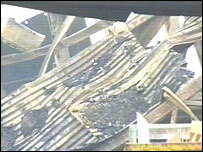 A warehouse depot nearly a quarter of a mile long is beginning to collapse after being destroyed by fire. Flames swept through the Whirlpool distribution centre in Paddock Wood, Kent, on Monday afternoon. Parts of the building were still alight on Tuesday. 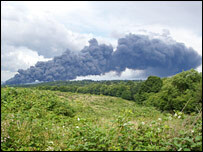 At its height a thick plume of black smoke was visible for up to 40 miles. Thirty firefighters were still at the scene on Tuesday damping down outside the building. No crews were inside the building which was starting to crumble. Greg Theophanides, a spokesman for Kent Fire and Rescue Service, said: "The building has been cordoned off because the structure is not safe. "Firefighting action at the moment is confined to damping down hot spots outside the building because it is not safe to put firefighters into the building." He said emergency teams would talk to Whirlpool about what the next stage would be for the depot site. About 100 firefighters from Kent and East Sussex tackled the fire at the warehouse which contained appliances like washing machines and refrigerators to be despatched across the country. A dense blanket of smoke covered the town after the fire started on the industrial estate at Transfesa Road at about 1615 BST. People reported hearing a series of explosions as appliances blew up in the heat. There were fears gas cylinders stored in the building could also explode. Witnesses described intense flames beneath a huge plume of smoke which was said to be visible from as far away as Essex and the north Kent coast. Emergency teams said firefighters worked throughout the night to control the blaze. No-one was injured. Train services on the nearby Paddock Wood to Maidstone West line were still suspended on Tuesday.